Kennedy Martin and Michael Parisher served as our 2018 Summer Interns. Through this program, these two emerging leaders in the United Methodist Church had the opportunity to cultivate leadership skills, vocational discernment, and explore their calls to ministry through immersive mission service. Hear about their experiences below. Initially, Martin's view of mission work was one of skepticism, perceiving that mission work consisted of privileged individuals coming into communities that they knew nothing about in order to criticize their way of life. It wasn't until she saw the example of her own loved ones that she began to see a place for herself in the mission work of the church. "My brother and his now girlfriend started traveling the globe and doing mission work," says Martin. "Along with physical things such as construction work, they would actually take the time to sit down with locals and have conversations about their faith and search for the comparisons between their respective faiths." This example of relational mission pushed Martin to explore mission on her own accord. From the West End neighborhood of her native Birmingham to Panama City, Martin has seen how mission work can be productive and empowering when done right. Martin gives an example of when she was on her church's team that served with UMC missionary Rhett Thompson in Panama. "(Thompson) knew the ins and outs of the community, and they loved and trusted him." she says. "Seeing him just be a part of the community rather than trying to 'save them' and ditch out was an inspiration." She also takes the time to consider how mission efforts can be imperfect. She learned that recently when engaging with locals in her neighborhood during a toy give-away for children in need. A mother in the neighborhood explained how it wasn't toys that her family needed, it was money to pay the electric bill so that her kids could have electricity. "No one asked me what I needed, they assumed what I needed," Martin recalls the mother saying. Martin believes that this can be a common mistake that mission teams make. "Going in trying to fix everything without knowing the people is the biggest mistake." This model of mission reflects what she believes it means to spread the love of Christ. She elaborates: "I think people see God's love through autnethicity and a genuine desire for relationship. The purpose of mission work is to go out and love your brothers and sisters- and to me that's evangelism in and of itself. It doesn't always need a whole lot of words." Martin will get the opportunity to immerse herself into mission this summer by serving with Reelfoot Rural Ministries in northwest Tennessee and with Global Ministries missionaries Gordon and Ardell Graner in the Dominican Republic. Michael Parisher, a rising senior at North Carolina State, views mission as the focal point of what the church does in the world. "For the Church to live out what it should be doing in following Jesus, it should be going!" explains Parisher. "Whether it be local, international, or down the road, Jesus called us to 'go and make disciples of all nations.'" Parisher aspires to respond to this call through his own career. A Business Administration major, he anticipates taking six months off after graduation to explore his call to missions before he attends divinity school in Fall of 2019. Parisher grew up serving with his local church, but his first international experience was in Costa Rica during high school. This trip was the beginning of a relationship that would mold Parisher's calling to serve as he felt God pulling on his heart to return. "As my language skills improved, I was able to build relationships. This drove me to continue going because I actually got to understand and learn people's stories and (see) how we truly connected through the universal Church and the body of Christ," said Parisher. Due to this experience, Parisher is very quick to stress what makes mission work transformative: relationships. Specifically, relationships where visitors and locals partner in the work that is being done. "The biggest mistake a team can make is expecting that they are the only ones that will be helping," he explains. "They too are a part of the Body of Christ and they have much to give to you as well. You have to view it as a two way street of relationship, instead of one way where we are just there to get tasks done our way." Sharing ourselves with one another drives Parisher's view of what evangelism can look like in a mission setting. "I don't think (the Good News) comes through by telling the world what we are against, but by showing love." Parisher says. "We can tell the world who we are until we are blue in the face, but the world won't see it until we show them Jesus' love by serving and being on mission." Parisher looks forward to growing his perspective on missions this summer. He will be serving with Reelfoot Rural Ministries in northwest Tennesse and with Global Ministries Missionary Doug Williams in Buenos Aires, Argentina. An aspiring missionary himself, Parisher looks forward to the growth that will come from this experience. "This is a great opportunity to see a lot of the aspects of mission, specifically with what the UMC offers," he said. "I look forward to diving deeper into what missions is and what elements of it I've not yet been exposed to." Join us in praying for these two emerging leaders of the United Methodist Church! 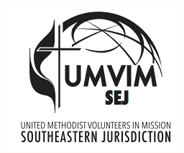 Interested in supporting UMVIM's efforts to equip a new generation of mission leaders? Click here to donate today!